Nuts aren’t new, I know. But they’re packed with protein and healthy fats, and a mainstay of a plant-based diet. But I think when I suggest them as a snack, people’s only association with noshing on nuts seems to be plunging their hand into a can of Planter’s cocktail peanuts or Smokehouse almonds. 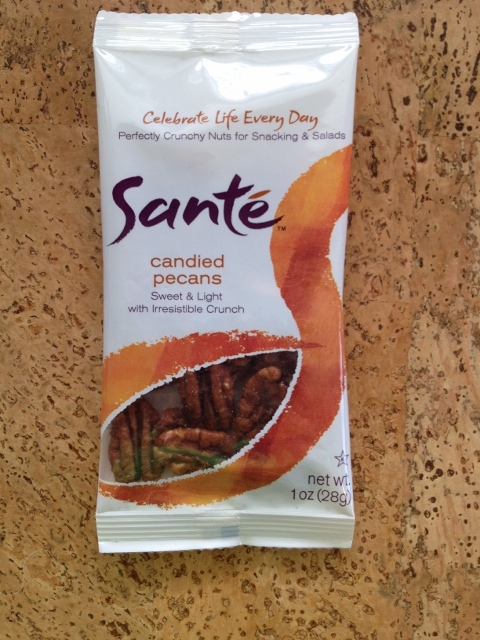 Compared to what Santé is doing with sweet, savory, and spicy seasonings, that is so 1985. Why I Loved Them: The Garlic Almonds and Candied Pistachios were creative flavor/nut combinations I hadn’t seen before, and the Candied Pecans paired perfectly with my free samples of dark chocolate (see #2 below). Nutrition Notes: Single-serve packs make them convenient and portion-controlled (1 oz. ), which is necessary with nuts. Especially sweet and salty nuts. And the ingredient list was simple: pecans, sugar, salt, and organic canola oil. Besides packaged products, I got to sample some freshly prepared bites from local restaurants. Happily, many of the chefs had come prepared with a vegetarian option. One of the most unique was a pairing of fresh tomato salad and tomato sorbet from Trace restaurant. 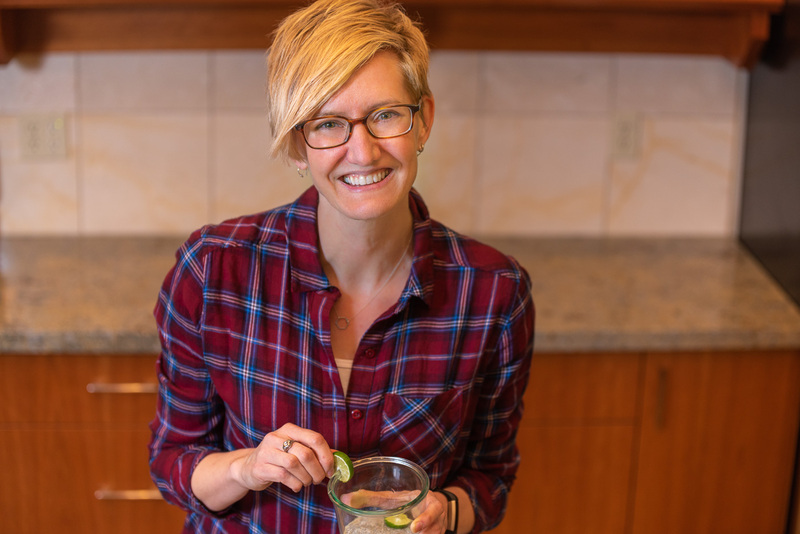 Why I Loved It: Who’s ever thought of making a vegetable sorbet? (OK, technically a tomato is a fruit, but in the kitchen, it’s usually treated like a veggie. So this seemed kinda revolutionary.) And freezing it in an orange rind? They win for super neato presentation. Nutrition Notes: I have no idea how they made it, but generally sorbet is a lower fat, lower calorie alternative to ice cream. And, if we’re going to reach the goal of 2-3 cups of veggies each day, maybe disguising them as “dessert” is one way to do it. Technically this isn’t a new find for me. 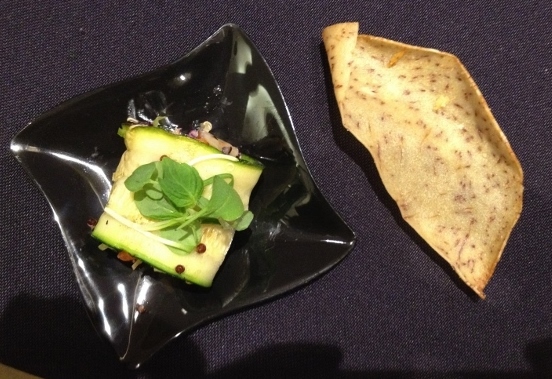 I’ve been eating these crackers for years, but I don’t think I’ve written about them on the blog and this was the first time I’d seem them at IFBC. AND I LOVE THEM. Why I Love Them: They’re pretty, they’re crunchy, and they’re packed full of nuts, seeds and dried fruit. (Again, with the sneaking servings of produce into people all unsuspecting-like…) Salty Date and Almond, Fig and Olive, or Pumpkin Spice; you don’t see flavors like that on the cracker aisle at the grocery store. Please forgive the guerrilla-style photographs. I was making my way through hundreds of bloggers, balancing bags of swag, food, and my phone unsuccessfully. This means blurry, dark pictures with shadows. You’re welcome. I know. This item is heavy on packaging. But, let me tell you what makes me happy about it. Why I Loved Them: Olives contain some monounsaturated fat, which is the good stuff, and the reason why olive oil comes so highly recommended. So, they make a great snack. But, if you’re like most people, you only crack open a can of olives once a year on Thanksgiving to put in a little relish dish with some pickles. They should go in our mouths more often, but most people wouldn’t think to open a can and divide them up into individual serving sizes for convenient take-along snacks. Maybe after seeing this product, they will. Nutrition Notes: This type of packaging does encourage portion control. 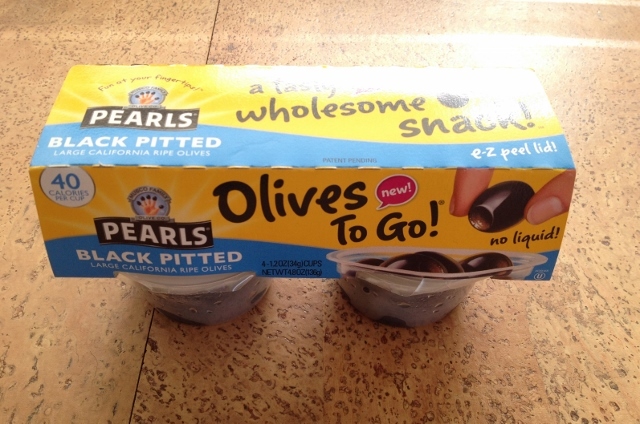 One little cup has 10 olives and just 40 calories. I got the Black Pitted, but they also had Kalamata and a couple of other varieties. This was another tasty bite offered up by a restaurant: Blackfish Grill and Bar. Since their menu is focused on seafood, I was pretty impressed with their ability to create such a delicious vegetarian appetizer. Why I Loved It: This zesty little zucchini delight was filled with roasted corn, black quinoa, 3 types of cabbage, and currants, and it was served with a crunchy taro chip. The many tastes and textures going on in one mouthful all married really well. Nutrition Notes: Veggies, fruit, and a whole grain. What more could a dietitian want? Beans are an important and yummy food group for vegetarians, and most plant-based food guides recommend eating them every day. Many people cite soaking and the cooking time as barriers to eating them more often. Let me introduce you to a more convenient ready-to-eat bean. 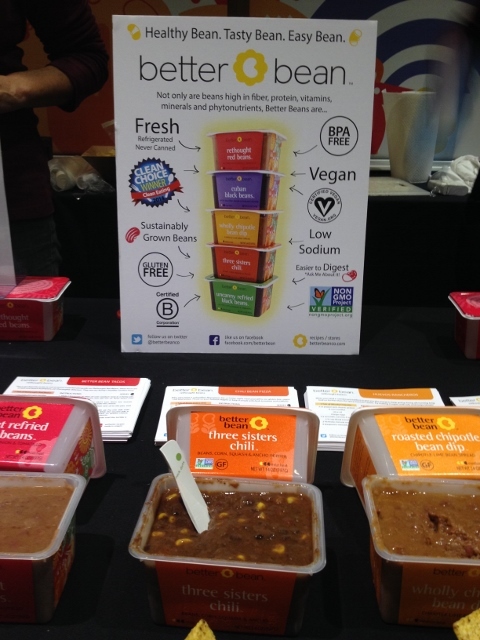 Why I Loved It: Cuban Black Beans and Three Sisters Chili are just a couple of the 5 flavors available, which seem like they would please most palates, even those not used to seeing beans on their dinner plate. You can find these products in the refrigerator section of the store next to the hummus. Nutrition Notes: They use organic beans and real ingredients, not to mention they’re vegan, gluten-free, high in fiber, and high in protein. Sushi is one of my favorite choices for eating out, but my plate gets awfully boring when there are only 2 fish-free options on a restaurant’s menu. Blue C Sushi must feel my pain, because they have 11 vegetarian rolls listed on their website and they brought a 12th one to share at the conference. Why I Loved It: I must admit, I didn’t catch the chef’s full description of all of the ingredients, but I got the basics. The filling was pickled vegetables and tofu. 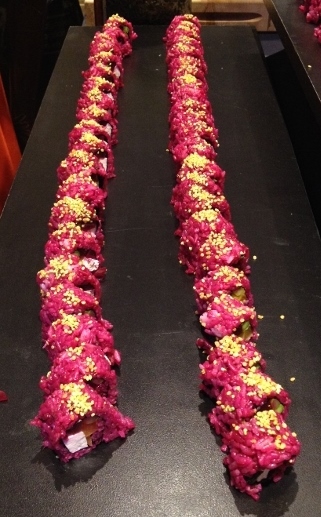 The rice was cooked in beet juice and the roll was topped with crunchy quinoa and wasabi. It was sour and a little sweet, but I was mostly blown away by the color. Nutrition Notes: What a fun way to eat your vegetables. The tofu means added protein, and with the rice it’s a well-balanced bite. OK, this one is an outlier. Technically it wasn’t a product at IFBC, but I did discover a refreshing beverage in the city of the conference, on the day of the conference, just down the street from the conference. I’ve written about Evolution Fresh before because they offer up quick, healthy (albeit expensive) meals on the go, with stuff like kale, butternut squash, and tofu on the menu. But since it was 9:00 am, I was only stopping in for something sippable. Why I Loved It: The Coconut Zen is a mix of coconut water, pineapple juice, and cucumber juice. It was sweet, but not too sweet, and it made for a nice mid-morning snack. I didn’t order it because I think coconut water is the perfect hydrator, and I don’t happen to think it quite deserves all of its current hype. But it’s definitely a healthy choice for a beverage and ordering it with pineapple made me feel all pina colada-y. Nutrition Notes: I got the large (16 oz.) so it was 100 calories. Pretty respectable. Based on their shape, I’m pretty sure they’re supposed to be used for melting, but I will pretend they are small, round chocolate bars and I will eat them. 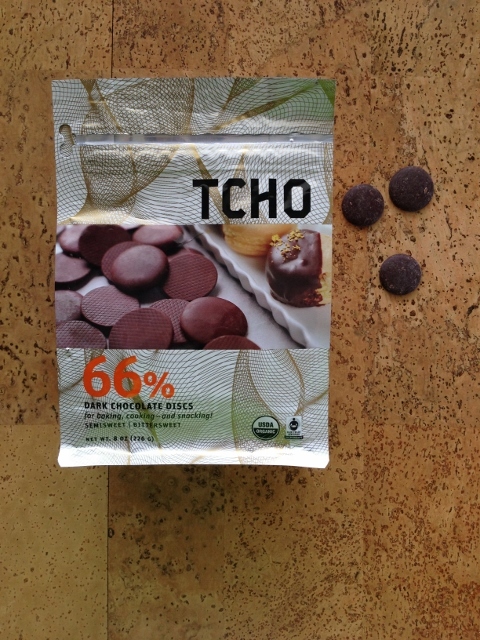 Why I Loved Them: The last time I was in San Francisco, I accidentally discovered my new favorite chocolate source by wandering past the headquarters of TCHO at Pier 17. Their Dark Bright 67% bar made me so happy I brought several home with me. Then, these showed up in Seattle at IFBC and I realized I didn’t have to smuggle the stuff across state lines any longer. Nutrition Notes: The darker the chocolate the better because it means more flavonols or health-protecting plant compounds, and these are 66% cocoa. And a 1 ounce serving is 13 discs, which for some reason feels more generous than my standard 2 squares of a typical bar. Aaaaaaand, they’re organic and vegan. That’s right. 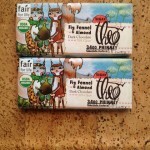 Finishing strong with two organic, vegan chocolates in a row! 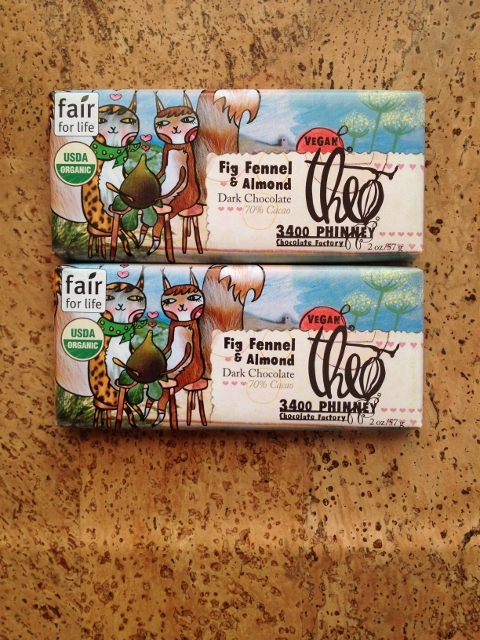 Why I Loved It: This sweet and savory bar is actually from a Seattle company, and I was already a fan before I saw them at IFBC. But I’d never sampled this particular product. I was delighted with the fennel; it definitely still tastes like a sweet treat, but with a nice mild licorice flavor. Like I said, there was a lot to eat. And I brought so much stuff home with me I’ll be sampling new products for another couple of weeks. Next up? Tofu Shirataki noodles. They’re gluten-free, dairy-free, kosher, cholesterol-free, and vegan with only 10 calories per serving. Sounds like something a hip Seattleite would eat. Have you made any new discoveries at the grocery store lately? Any must-have products you want to share? Disclaimer: With the exception of the juice at Evolution Fresh, all of the products mentioned here were given as free samples to conference attendees but I don’t have any relationship with their companies and didn’t receive any monetary compensation for this post. And, while I would have shared my finds with you anyway, I did get a discounted registration fee for agreeing to blog about the conference. Great post. I’m getting hungry all over again looking at all the delicious food we had! Loved your top ten!! 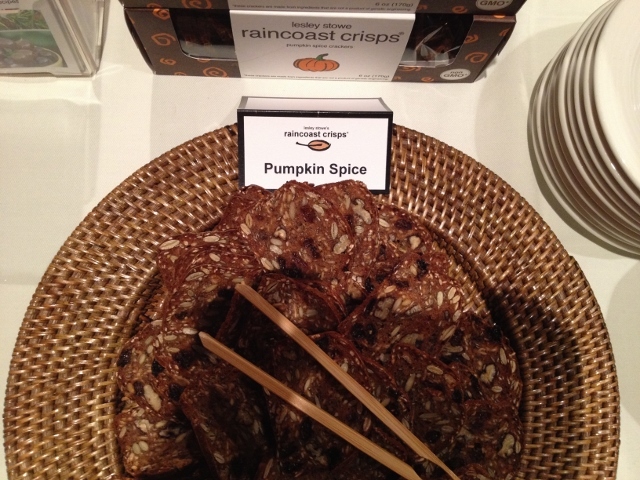 … and those Taro Chips??? … OMG. to DIE for. I just need to know where I can get a big ole bag of ’em!! maybe a little guac on the side… oh boy. ok I take that guac back and will just add that those taro chips PLUS a big ole scoop of better beans? I’m not sure it would be better with a margarita but I’m willing to experiment. I’m sure the nutritionist in you is calculating the calories and I’d have to beg you to stop…. or bait you with a margarita! It was lovely meeting you at Sur la Table! Hi Miss Alice! Thanks for stopping by my site. It was so lovely meeting you as well. And I used my custom coffee sleeve this morning! 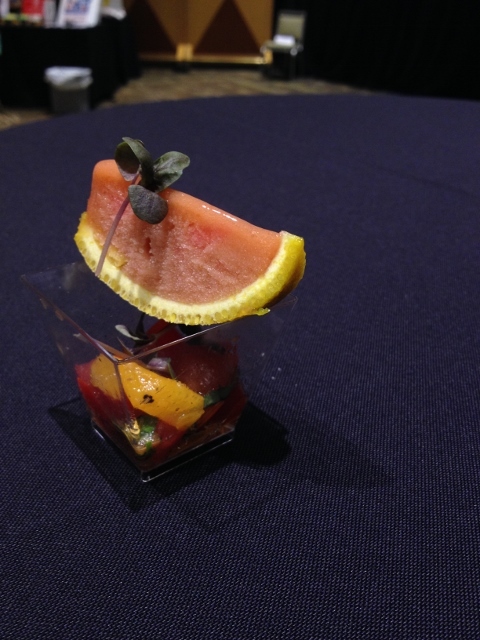 Pingback: IFBC 2014 Foodie-Find Awards!